For many years I've been writing and speaking about the impact of technology on Jewish life. In 1995 I had the idea to use email (it was still fairly new at the time) to ask random people around the world to wish my brother congratulations on his upcoming bar mitzvah. The response was overwhelming and it got me thinking about the power of the Internet and how it would make the Jewish world smaller. So, as an International Relations major I titled my college thesis "The Globalization of Judaism: How the Internet has Heightened Jewish Religion, Cultural Awareness, and Education on a Global Scale" and tried to predict how technological innovation would change the global Jewish community. Steve Jobs, a Zen Buddhist follower, is largely responsible for the way we have plugged in to new technology and communication devices. His contributions to technological innovation have indirectly altered Jewish life for the better. We are a more interconnected, organized, and educated people thanks to the genius of Steve Jobs. 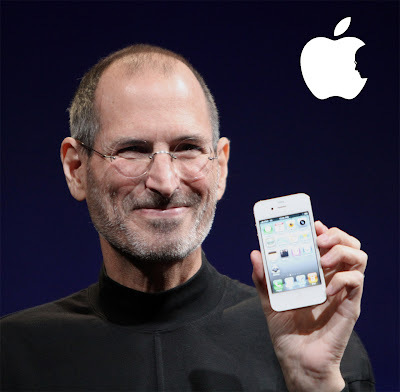 Like millions of others, when I heard that Steve Jobs had succumbed to Pancreatic Cancer yesterday evening, I immediately began to think about all the ways I've used the Apple products that have his visionary imprint on them. While I've always favored PCs above Apple computers, I have had my share of Apple products -- from Mac desktops to iPods. The role of Steve Jobs at Apple always had less to do with the technology side of the corporation and more to do with the business, marketing, and creative aspects. Social networking sites began buzzing immediately after word spread of the death of Apple Computer visionary Steve Jobs Wednesday evening. Rabbis took time out of their busy preparations for Yom Kippur to halt their sermon writing and post personal reflections on what the contributions of Steve Jobs’ creative spark had on them. Rabbi Andrew Pepperstone of Dewitt, N.Y, posted to his Facebook page, “Is Steve Jobs a hero? If someone who has vision, discipline, passion, and love for what he does is a hero, then yes. It was not about the money or the fame for him. It was about changing the world in a million little ways that improved peoples' lives. And his devices and other inventions have been a major breakthrough in helping people with disabilities communicate and employ the best that technology has to offer.” Earlier on Facebook, Pepperstone recounted the plethora of Apple computers and gadgets he had used since his first Apple IIe in 1984. Over the past three decades, the technological innovation that was inspired by Steve Jobs’ vision had a significant effect on the Jewish community. His genius was in intuiting what would happen when you “strip away the excess layers of business, design, and innovation until only the simple elegant reality remained.” The ways in which Jewish education and Jewish life have been positively affected by the products that Steve Jobs dreamed of and made into a reality are countless. His iPods made Jewish music and Jewish learning more accessible. His computers brought graphic design to new levels for Jewish institutions like synagogues and day schools. His Facetime application on the iPhone allowed Jewish communities separated by continents to come together and communicate. The geographical distances and borders have become irrelevant thanks to the innovative contributions of this genius. The thousands of Jewish themed applications from utilities to resources to games were created specifically for the iPhone and iPad. Steve Jobs’ understanding of efficiency and connectivity led to the intuitive devices that have changed the way we work and connect with each other. The Jewish high school that has its students learning Talmud and chemistry on the iPad owes a great deal to the work of Steve Jobs. The father who created a slideshow of memories set to music using iMovie for his daughter’s wedding is indebted to the vision of Steve Jobs. The young boy living in a remote area of the country who is preparing for his bar mitzvah by listening to a New York cantor’s podcast on his iTouch is grateful to Steve Jobs. Did the devotee of Zen Buddhism have a Jewish spark in him? Perhaps he did. There is no doubt that Steve Jobs had a profound effect on the Jewish world. His dynamic legacy will continues to make the world better as we continue to plug in and connect with each other in just the way he envisioned and using the devices he helped design. If the value of Tikkun Olam really means leaving your imprint on the world in a quest to make it a better place for all of us, then Steve Jobs possessed that value a thousand-fold. May the memory of Steve Jobs be for blessings and may his family be comforted during this difficult time. Although I personally do not have and never did have any of Steve Jobs blessed creations- my sons sure do- I do appreciate the greatness of the man and that his life's work definitely qualifies for our very Jewish Tikkun Olam.In his rather short a life, his effect on life the world over was hard to measure and quantify and will continue for a long time after his untimely death. Yehi zikhro barukh. I enjoyed and shared this article, and I'm even making mention of it in a Yom Kippur sermon on "The Oldest Newest Thing." Thanks for reminding us how communications technology has benefited our community, and how much Steve Jobs contributed to the world with his creativity and vision. I liked your article very much. It made me think about the huge power of technology as a tool to spread the Jewish word, and how Steve Jobs, zichrono l’bracha, contributed to this. I’ve translated the article which was posted on Radio Jai, the only Jewish Spanish-speaking Radio, based in Buenos Aires. I think that there is one very important rule for writing such essays. Using this site you can get advices about writing thesis. So it will be definitely useful!